Trolley bridge over the Clackamas is now gone. 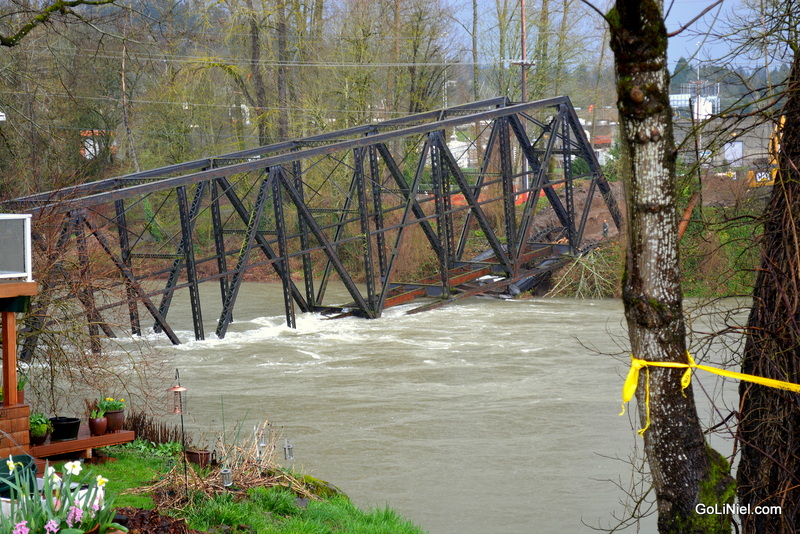 This bridge, over the ClackamasÂ River, and owned now by Union Pacific, had seen better days. The bridge is an abandoned remnant of a trolley line that connected Oregon City and Portland It stood for more than 100 years but had not been used since the 1950s. 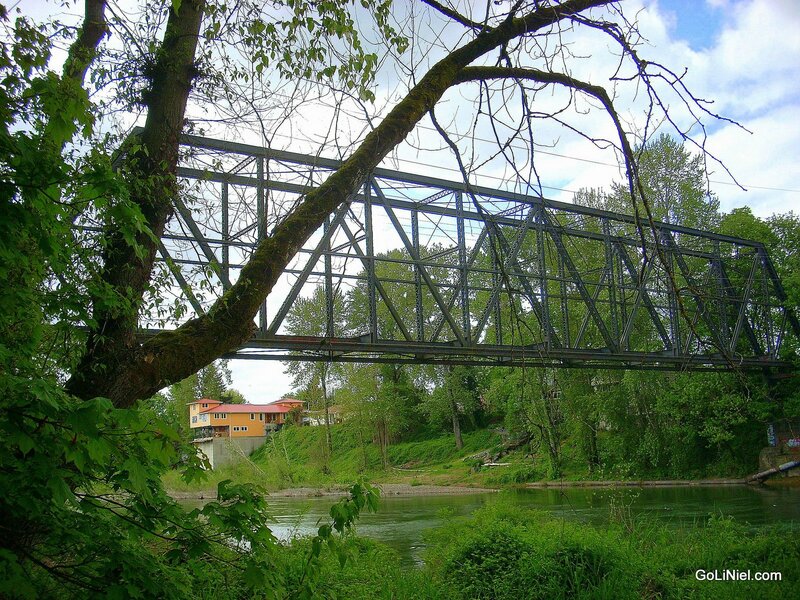 The steel truss bridge was part of a regional trolley line that was constructed in the early 1890s through Southeast Portland, Sellwood and into Oregon City. The bridge was likely built in the 1900s, but by the 1940s weight restrictions were imposed on the structure. In 1968, the Portland Traction Co. ran its last trains from Golf Junction in Sellwood to the Oregon City paper mill. That section of the trolley track was abandoned, along with the old bridge. The line was purchased by Southern Pacific Railroad, which merged with Union Pacific in 1996. Also known as the Portland Avenue Historic Trolley Bridge it was located on the Clackamas River between the cities of Gladstone and Oregon City. Â The riverÂ has eaten away at the footings of the 290 foot long, and 18 foot wide structure. With a history of neglect, the bridge was pulled down, before it fell down. Heavy equipment yarded it up on to the bank where it was torn apart section by section, and hauled away. All trace of the bridge, and its 1,000 tons of iron, steel, and concrete are now gone. This entry was posted in Spanning the Bridges on March 30, 2014 by golinielcomblog. Milwaukie has installed a new bike rack in the middle of what is slowly becoming a waterfront park area. So…… Here is what Milwaukies web site says about it. The Milwaukie Riverfront got a touch of whimsy this week with a new artistic bike rack by sculptor Ben Dye. The bike rackâ€”shaped like a trolley stationâ€”celebrates the adjacent Trolley Trail path and the history of transportation in the region. The project also aligns with the Trolley Trail Public Art & Amenities Guide and provides functional art for cycling enthusiasts. The rack features a station platform for playing on; trolley wheels for securing bikes to; and a station bell which will display refuse from the River inside as an educational component. The Trolley Trail logo is also featured, designed by artist Carrie Moore. A â€œtest bikeâ€ will be secured to the rack for several months so users know its OK to use the sculpture as a bike rack. The City has received the bike rack as a gift from We Love Clean Rivers and the project was managed by Clackamas County Arts Alliance. The bike rack is one of three made from materials reclaimed from the Clackamas and Willamette Riversâ€”highlighting the need for keeping our rivers clean and our transportation green. Funded through a grant from Clackamas County Tourism & Cultural Affairs, three original racks are to be placed within the three cities along the Riverâ€”Milwaukie, West Linn and Oregon City. A dedication celebration will be held in Milwaukie in the spring. Now……. Honey and I disagree slightly on our opinion of this as a functional, as well as artistic installation. Lets guess who likes and who doesn’t. This entry was posted in Bicycling & Fitness on March 17, 2014 by golinielcomblog.